A California-based Forest Service researcher says treating lodgepole pines with a substance called verbenone could cut pine-beetle infestation rates by 30 to 60 percent. Recent experiments suggest that applying pheromone flakes from the air could be a way to protect high-value stands of trees in Summit County and elsewhere, including areas around campgrounds and even forests bordering ski-area trails. When bark beetles sense the presence of the naturally produced substance around trees, they tend to disperse, thinking that a potential host tree already is occupied. The pheromone is a chemical produced by the bugs themselves, but it can be replicated in the laboratory. The biggest challenge for the Forest Service has been finding ways to apply verbenone effectively. “It’s hard to make it work out in the woods. 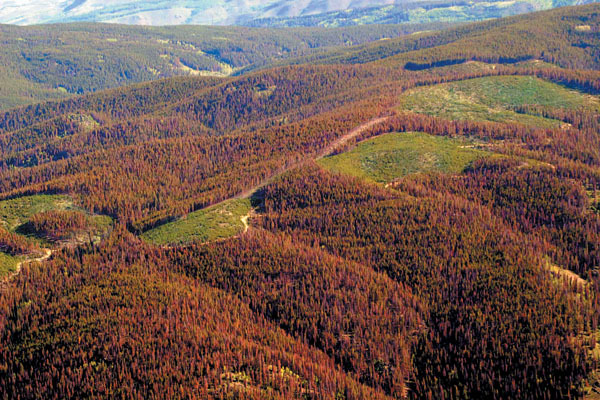 We have worked with it quite a bit, and it has a long and tortuous history,” said Jeff Witcosky, an entomologist with the Rocky Mountain regional Forest Service office. “The biggest problem is that we’ve had variable and unpredictable outcomes. It’s effective when beetle populations are low,” Witcosky said. The scale of the southern Rockies beetle outbreak is uncharted territory, according to Witcosky, who has been studying various species of bark beetles for 26 years. “If you go into a campground and take out the infested trees and treat the green trees (with verbenone), you could have good success. It may give you some short-term protection, but in the long run, the beetles will prevail,” he said. Witcosky said the Forest Service has used verbenone to protect stands of whitebark pines along ski trails in the northern Rockies ” at least temporarily. That success might be partially due to the fact that the areas are higher and colder, thus limiting the life cycle of the bugs. In those conditions, the beetles need two years to complete their life cycle, leaving the eggs more susceptible to cold temperatures. That can suppress the rate at which the insects spread. But there’s evidence that, when the bug populations are very high, and the stands are at an age and in a condition that makes them susceptible, there’s very little that can stop them, Witcosky said. In those circumstances, they tend to ignore the pheromone and mow down every tree they can find. Gillette, on the other hand, said her research suggests that the beetles can be deterred, even at high population levels, with an efficient application of verbenone. The agency has used similar treatments ” with varying degrees of success ” to treat outbreaks of different species of bark beetles, including bugs that attack Douglas firs. Witcosky said the application method tested by Gillette is completely new and may hold some promise. “We’d like to see more data and peer review of the science,” he said. During the tests conducted by Gillette, the pheromone was applied in June or July, depending on elevation, just before the insects fly to new targets from the trees they’ve already killed. Gillette said the research suggests that verbenone could effectively protect limited areas of high-value trees ” around campgrounds and ski trails, or pockets of seed-producing trees needed to reforest an area after the beetles have marched through. The tests showed no negative environmental effects, Gillette said. To measure those impacts, the researchers counted numbers of other insects and especially pine-beetle predators in the test plots where verbenone was applied and in control plots that were left untouched. “There was no difference in the numbers between the test plots and the control plots,” she said. Effective pine-beetle pesticides also tend to wipe out populations of beneficial insects. Gillette said she conducted her tests in California and Idaho on several test plots. In areas with low to moderate infestations, treatment with the pheromone cut the infestation rate of healthy trees by up to two-thirds. In areas with high beetle populations, the treatment reduced the infestation rate by about 30 to 35 percent. Spraying it in targeted areas via helicopters holds the most promise. According to Gillette, the cost of treating areas with low to moderate beetle populations is about $100 per acre. Treating areas with high bug concentrations would cost up to three times as much, since more of the pheromone needs to be used. Still, that cost compares favorably with other options like thinning, which can cost more than $1,000 per acre, or, in a worst-case scenario, cleaning up after a major wildfire. Applying verbenone would likely require the Forest Service to perform the requisite environmental studies with a lead time of several months. Gillette said the application is not intended to protect vast areas of backcountry forests. In some areas, old, even-aged stands of lodgepole are going to die one way or another ” put simply, their time has come. But she said a targeted application clearly has the potential to be effective in protecting at least some concentrated areas of trees.